On September 12, Catherine Nicholas, CIO and Portfolio Manager, joined host Gillian Kemmerer and three other small-cap managers to discuss some of the current and prospective drivers of small-cap stock performance. • At 1:54, Catherine comments on the strength of the current environment driven by strong reported revenues and earnings. Innovation, she highlights, has been a key catalyst for technology, healthcare and consumer discretionary stocks. The near term looks good, she says, but longer term risks include the potential impacts of trade wars and a strong US dollar on emerging markets. 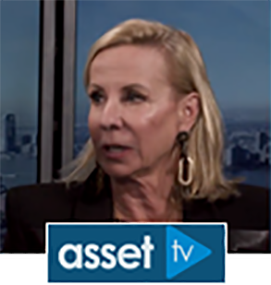 • At 8:38, Catherine shares her constructive outlook for small-cap stocks, though cautions she is conscious of and closely watching areas of the market that trade at extended multiples with little or no earnings, e.g., software-as-a-service (“SaaS”). • At 20:28, Gillian asks Catherine about how she identifies new ideas, especially in companies with short histories and perhaps no earnings. Catherine gives examples of the characteristics of companies that meet our investment philosophy’s three pillars of change, sustainability and timeliness. 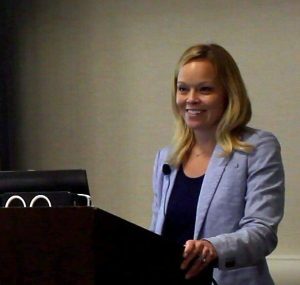 At the CUSO Financial Annual Conference in August, Lisa Wheatley, Portfolio Manager and healthcare specialist, shared her insights on the long-term, secular innovation cycle in healthcare, ripe with investment opportunities. 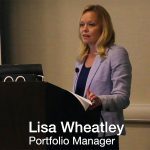 (3:24) Lisa highlights why our firm’s San Diego location is an edge in her healthcare-company research and why early-stage biotechnology and medical device companies can produce private equity-like returns to public-market investors. In contrast to other sectors, particularly technology, these companies come to the public markets sooner to fund the costs of product development and regulatory approval. Therefore most of the upside can be experienced later in a company’s lifecycle, and—importantly—after data read-outs and other performance metrics de-risk much of the uncertainty around the technology and management team. (5:54) Learn about specific disruptive technologies leading to a renaissance of innovation across the healthcare sector. Examples Lisa discusses include Car-T cell therapies, CRISPR/Cas9 gene-editing technology, gene therapy, robotic surgical technology, and the harnessing of “Big Data” to improve patient outcomes and ultimately reduce costs to the healthcare system.